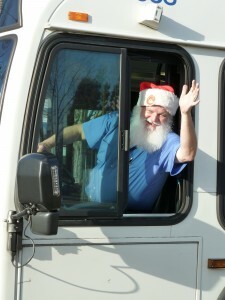 TriMet riders on the Line 48 will have the opportunity to ride along with Santa in the days leading up to Christmas. Bob Foster, also known as Santa Bob, has logged more than 31 years at TriMet and more than 27 years moonlighting as Santa for families across the Portland metropolitan area. Each December, this Hillsboro resident parks his bus to don a red suit and hat, and play jolly St. Nick around the region. This season Foster has been a volunteer Santa for the Hillsboro School District’s life skills programs and also volunteered his time, this past Saturday, Dec. 21, to help raise funds for a family in need through the Levert Franklin Mission Foundation. On Tuesday, December 31 (New Year’s Eve), we will operate regular service with extra late-night service on MAX and all service will be free after 8 p.m. More at trimet.org/schedules/holidays.